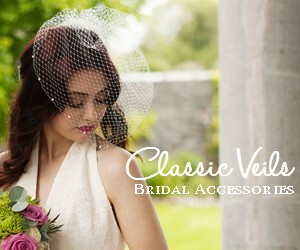 We’ve scoured our back catalogue of real weddings as well as other online wedding sources we hold near and dear. 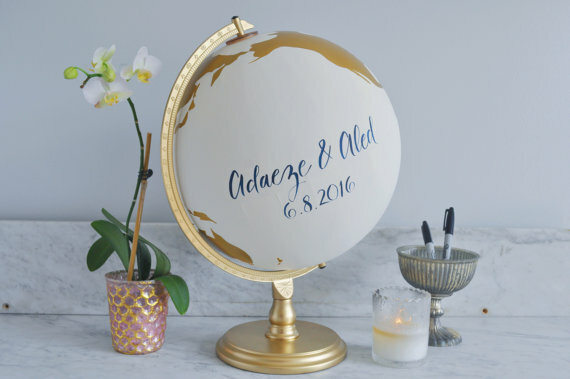 Scroll down to go directly to our round-up list of 20 creative wedding guest book alternatives that are a tad more exciting to read through than a standard guestbook. 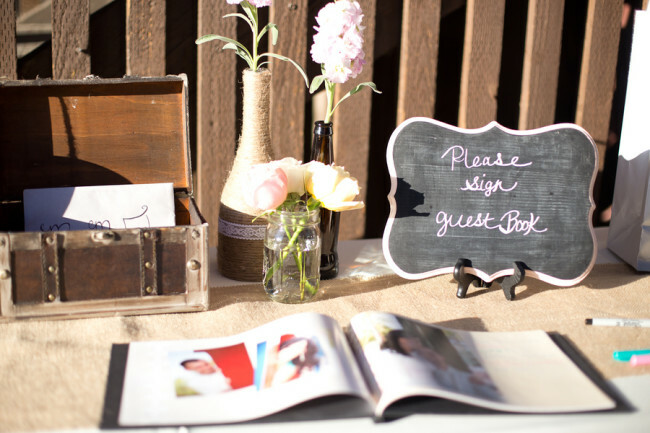 A wedding guest book no longer needs to be pen and bound paper. 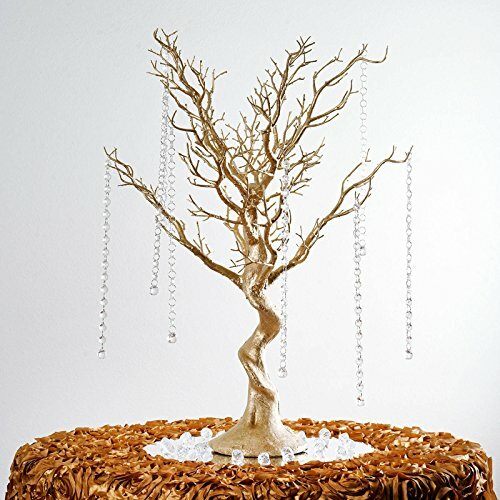 The form and shape of the traditional guest book has morphed to match changing wedding trends and tastes. 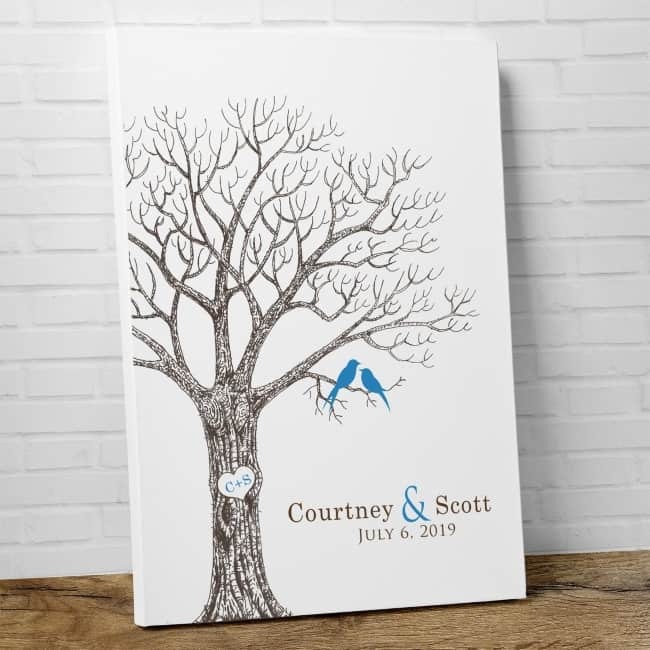 Sure, the purpose of a guest book is to capture the names and well wishes of those special individuals who actually attended your wedding. However, we’ve seen many creative ways to accomplish this goal beyond pen and paper. Let me ask you: which guest book idea is more exciting? For Love & Lavender’s own wedding, we opted for number 2! 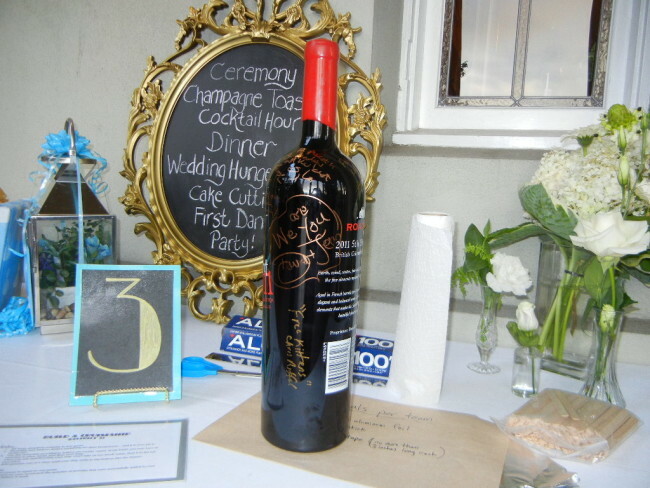 Below is the picture of the unique wedding guest book Love & Lavender used at our wedding – a giant wine bottle! My husband and I love sharing a good bottle of wine now and again. So when Andrew went to Osoyoos for his bachelor party, he simply had to pick up a Jeroboam bottle of wine from one of his favorite Canadian wineries (Road 13 Vineyards). Mind the eclectic mix of aluminum foil, wood popsicle sticks, and other sundry items on the table. They were all part of the wedding hunger games we devised as part of our reception. No, not a type of wine, it’s actually the official name for a wine bottle size … FOUR bottles of wine in one to be exact! That left plenty of surface space for our guests to write their names and well wishes using gold and silver color felt pens. The plan is to let this particular red wine blend age to perfection, and then uncork it for one of our bigger wedding anniversaries surrounded by special family and friends. Its a meaningful guest book and one that we can enjoy and share years later. Let’s face it, four bottles is great to share between a husband and wife, but I can only imagine the morning after. 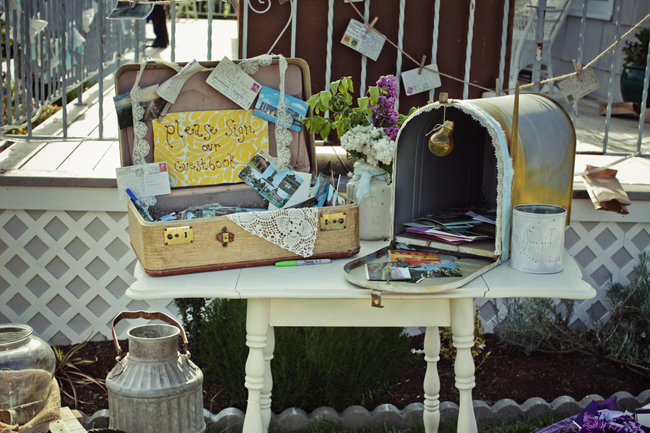 When it comes to your own wedding guest book, put on your brainstorming hat and choose something that is meaningful. 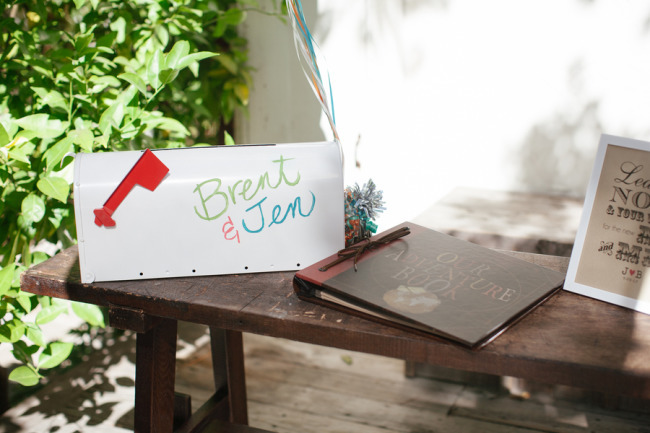 Whatever you choose as your wedding guest book, don’t have another dust collector sitting on a book shelf. Drumroll please! Creativity and weddings are a natural match. 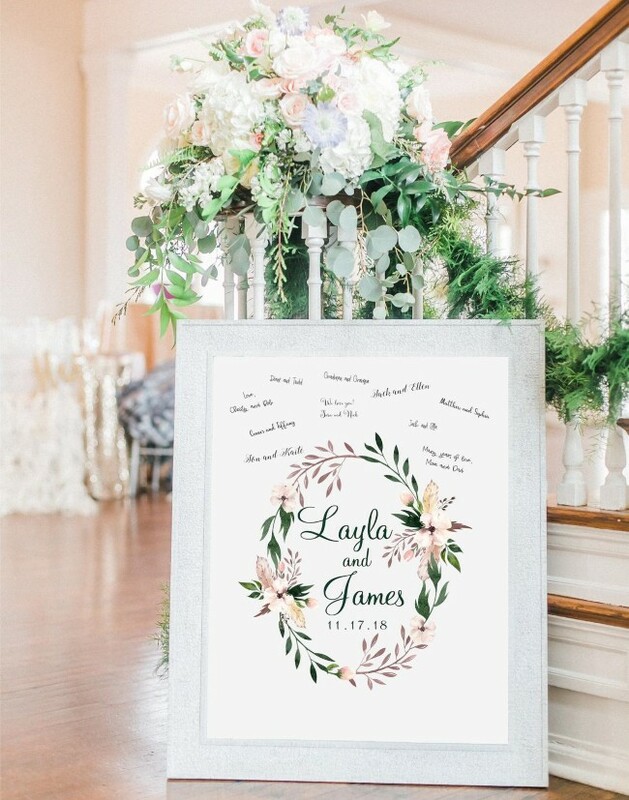 And when it comes to wedding guest book alternatives, in recent years we’ve seen some pretty creative and imaginative ideas here on the wedding blog. 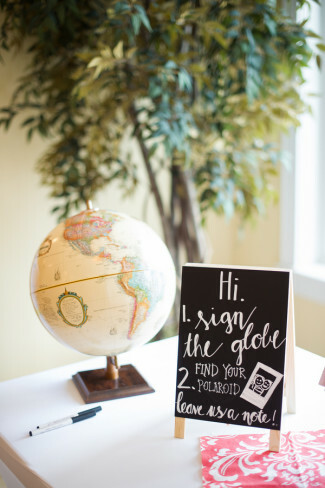 Add a bit of fun to your wedding day by coming up with a unique alternative idea for a guestbook. Let us know if you have a favorite once you’ve gone through the list! 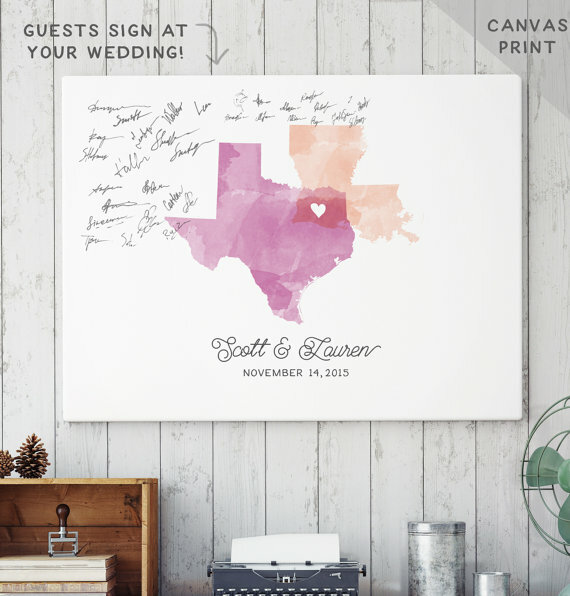 Assemble postcards of the city or state where your wedding is held. 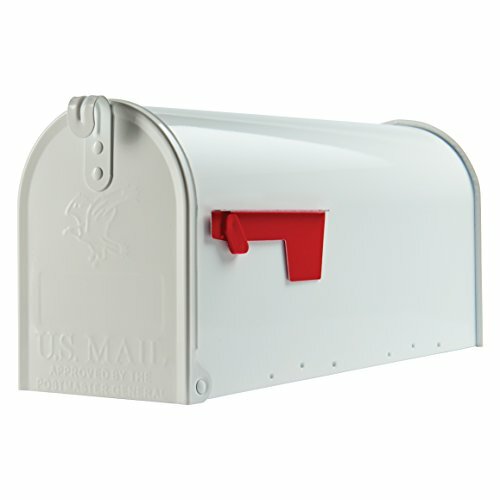 Ask guests to sign the back of a postcard and slip it into a unique mailbox. 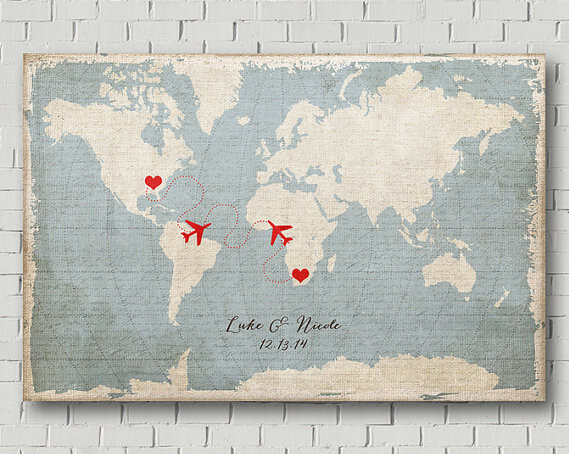 This guestbook type would be perfect for a travel-themed wedding! We la-la-love this idea. 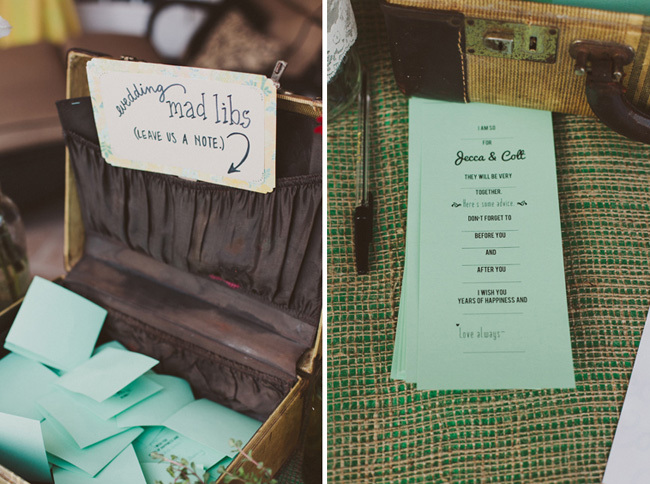 Have guests complete a fun wedding mad libs. Grab you own fitting Wedding Mad Libs from Etsy. Such a sweet and unique idea! DIY your own background by drawing a tree with lots of empty branches on a poster. At your wedding, place a sign asking guests to “leaf” a fingerprint and sign their name. 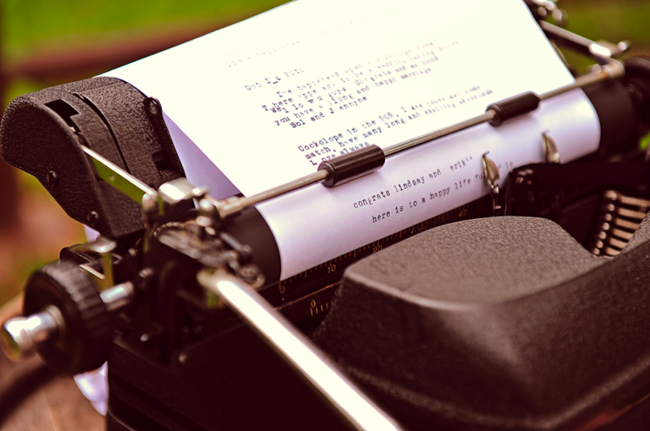 It’s not a new idea, but we still love vintage typewriters as guestbooks. Provide direction like asking guests to share some words of wisdom, and you’ll get more interesting responses. Yup, you can still buy a vintage typewriter on Etsy! Get a poster that means something to the both of you. 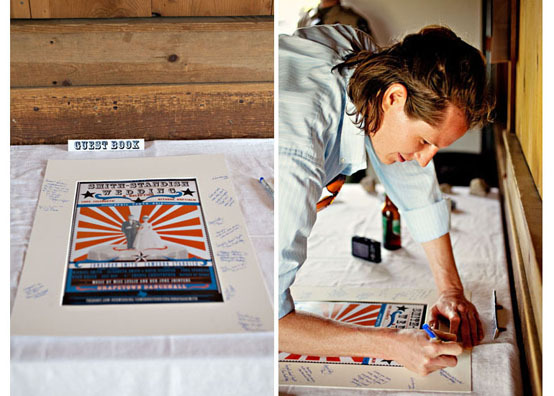 Ensure the poster has a large border edge space for guests to sign. 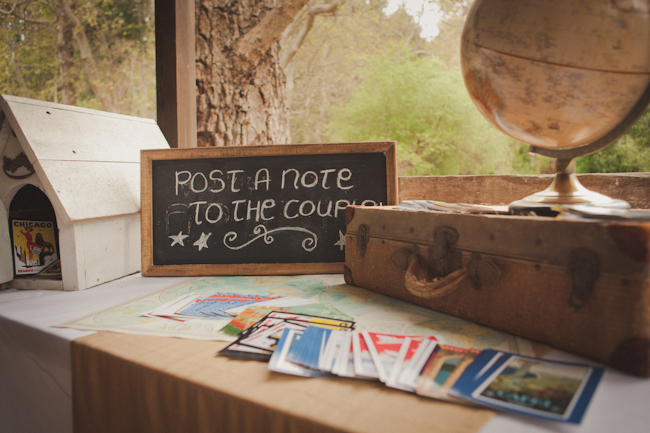 Leave instructs for guests to write a message and you’ll have a wonderful keepsake for years to come! Another spin-off of the photo booth guestbook is to let guests take Polaroids of themselves, mount them in a book, and sign next to their photo. 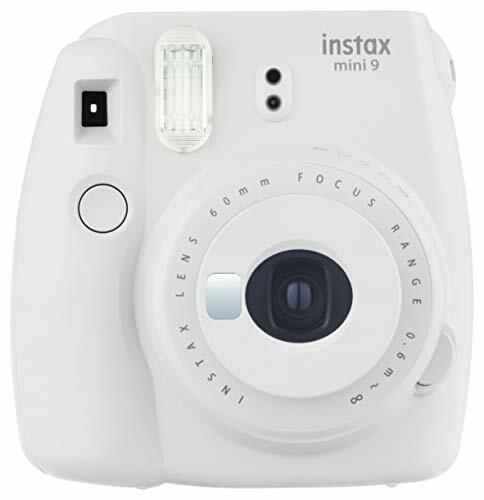 Find a Fujifilm Instant Film Camera on Amazon for a reasonable price. Oenophiles (those who really enjoy wine) such as Love & Lavender will love this wedding guest book alternative! 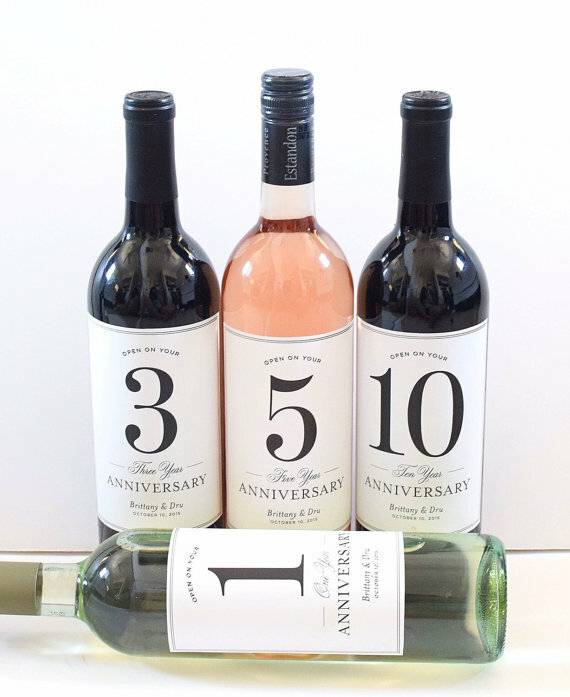 Guests can either sign their names and messages directly onto a bottle or via custom wine labels. Years later, pop the cork and drink to celebrate a milestone wedding anniversary. A wine theme guest book provides both a fun idea on your wedding day as well as an event to dream about and look forward to in the future. My husband and I collect corks from bottles of wine that mean something to us. In fact, Andrew’s boutonniere was made out of the champagne cork that we drank on the night we were engaged. Read more about that particular unique boutonniere here. 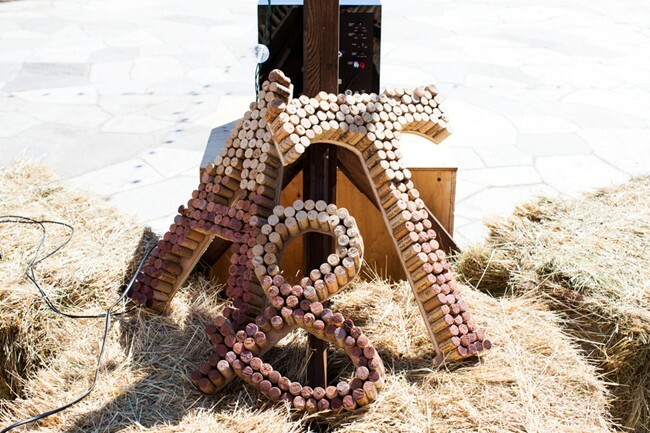 If you like to save wine corks too (I Google’d and couldn’t find a cool name for this type of collector! 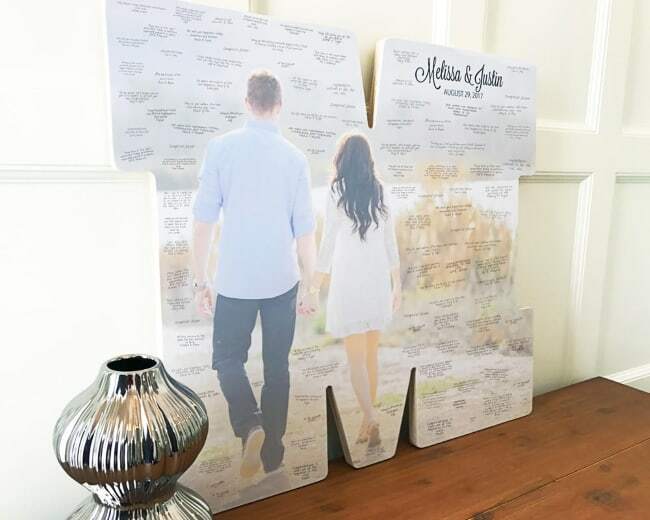 ), another idea to incorporate into your wedding guest book is pictured below. 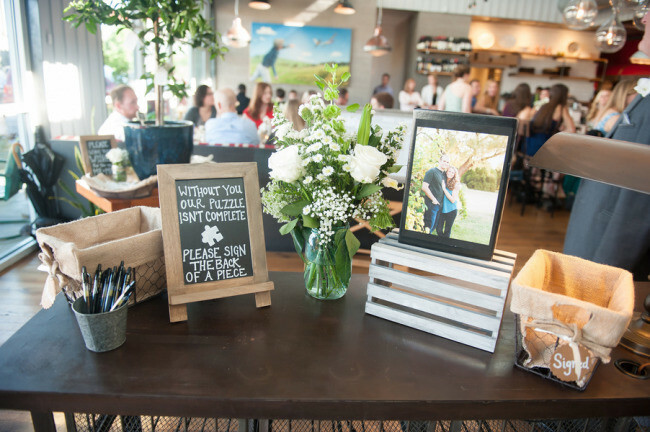 Guests sign a cork and place it into a shadow box. Does music play a big part in your life? 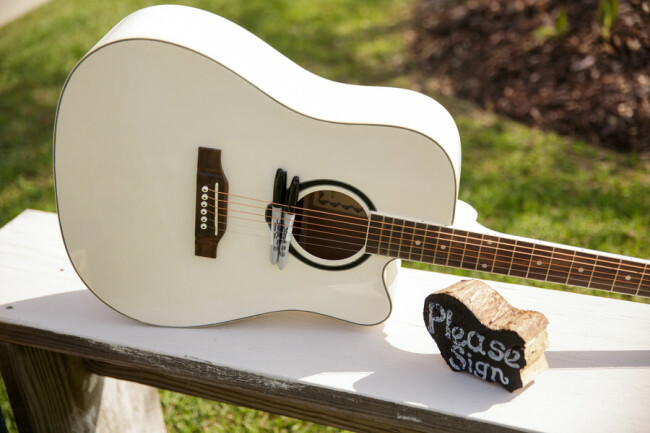 Share your passions with wedding guests by having them sign a musical instrument, like a guitar. 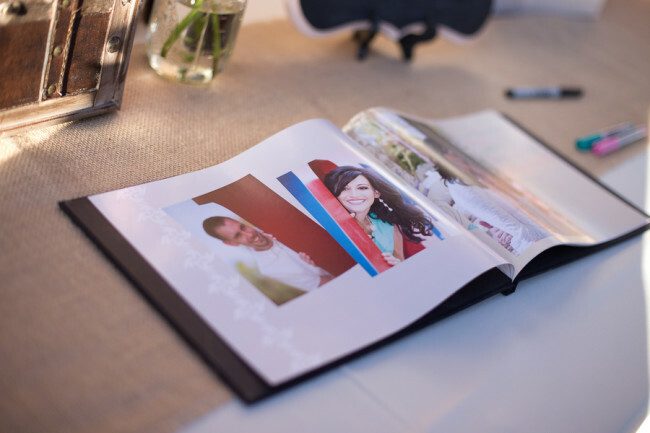 Nonetheless, use your engagement photos to create a custom made book that your wedding guests can sign. I think it will be a treasured keepsake for you as a couple. 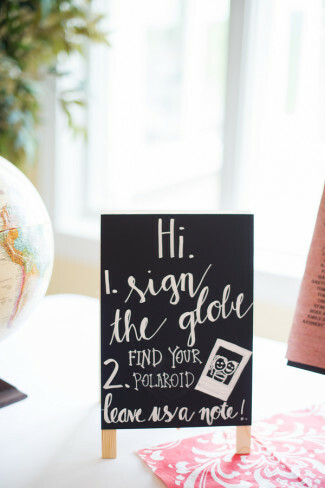 I’m sentimental, so I actually think this is one of my favorite guest book ideas of all! Create your own custom book with Mix Book. 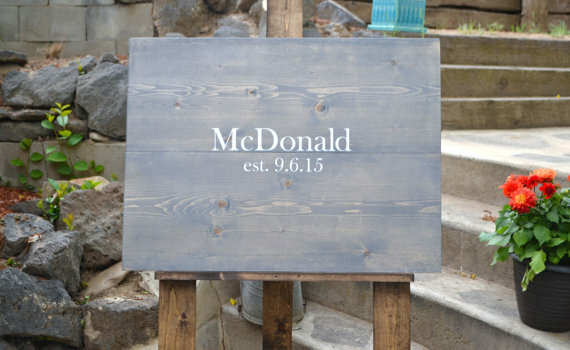 A rustic wedding needs a guest book to match the theme. Nothing says rustic woodsy like a tree trunk slab. Have your guests sign a custom make wood slab for a keep sake you can hang on a wall … or in your husband’s man cave. Who doesn’t love a good board game? 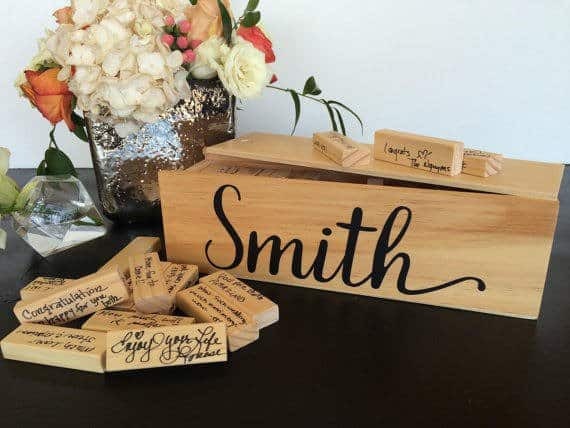 Incorporate games into your guest book theme and get guests to sign their very own Jenga piece. Ah yes, brings back fond memories every time I take one from the bottom and stack it on top! Pet rock anyone? This may seem like a weird (and potentially free) idea. However, perhaps you both enjoy strolling along a beach and have collected numerous special rocks or shells along the way. 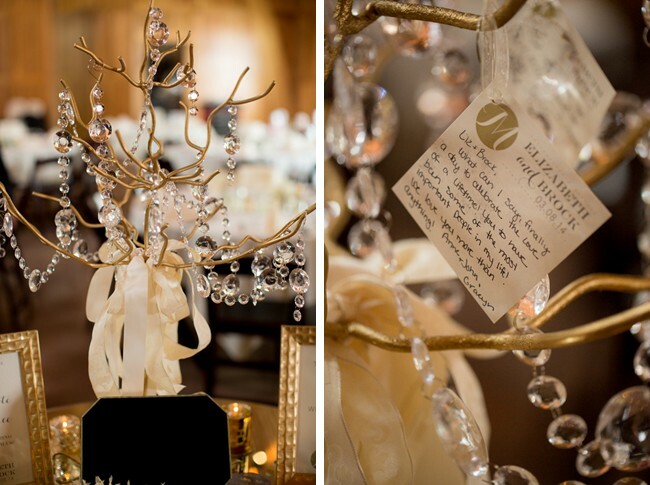 A fun and different idea is to have guests each sign a rock or shell. Add them to your garden or keep them in a vase as a fun memento. Sports fans or sports coaches will certainly love the idea of a pigskin at their wedding. 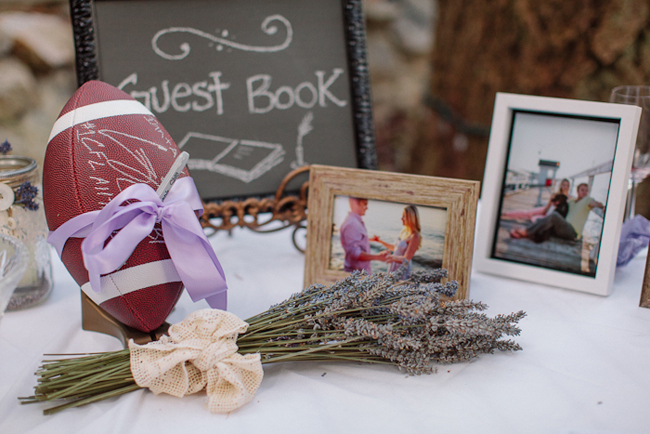 Get your guests to sign a football, soccerball, or basketball to keep as a memory of your big day. Last but not least, rather than giving a couple your best wishes I really like the idea of giving them advice on relationships and love. 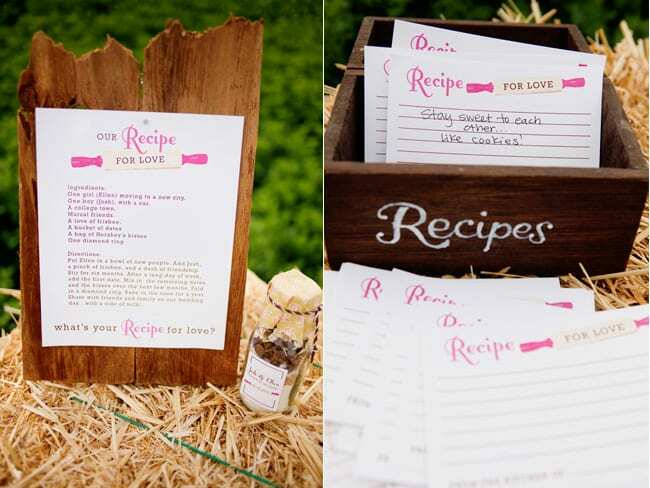 Let guests fill out their own recipe card for love. Music lovers we have you covered! 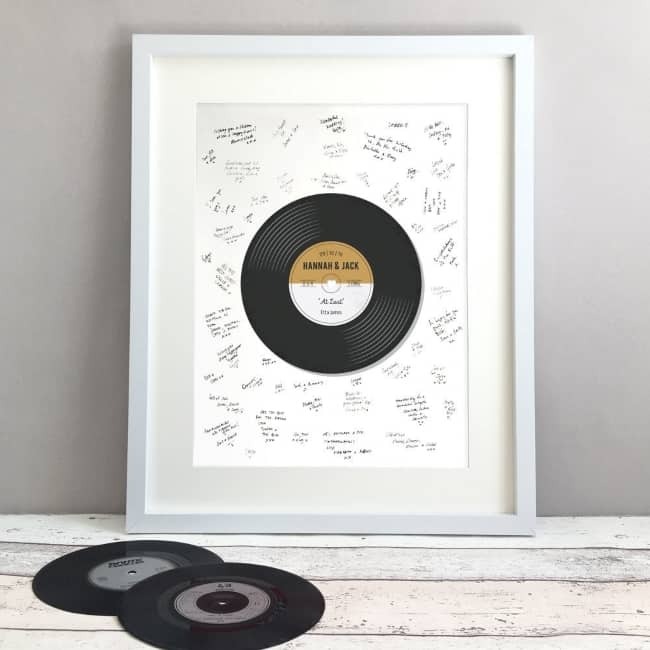 With your first dance song written in the center of the printed vinyl record, all of your guests will be able to leave a sweet message around the sides. This will make a great keepsake to hang in your home and a great way to cherish your first dance song. I hope you’ve been inspired by our round up of unique wedding guest book options ideas. Please let me know in the comment section below if you have come across another unique guestbook that we should know about. 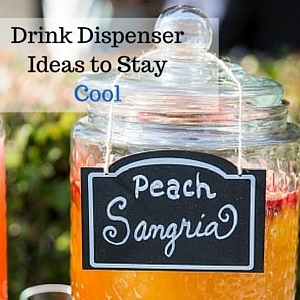 Be sure to check out our Ultimate List of Things To Buy For Your Wedding Day post. 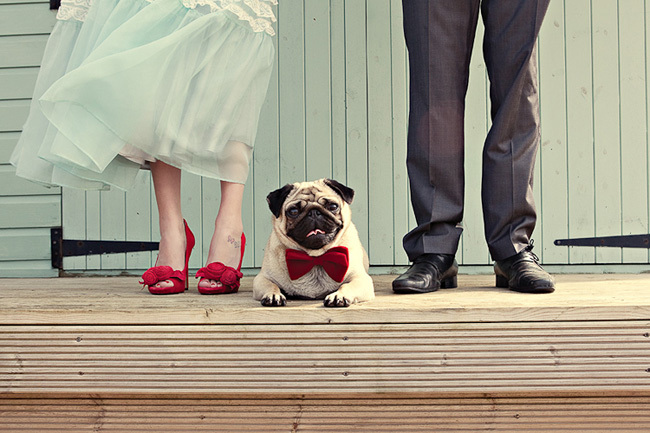 Because even the best wedding planners can overlook a few items!